If any of your vehicle’s lights, accessories, or controls do not work, check the appropriate circuit fuse. 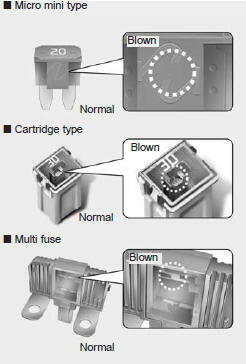 If a fuse has blown, the element inside the fuse will melt. If the replacement fuse blows, this indicates an electrical problem. Avoid using the system involved and immediately consult an authorized Kia dealer. Three kinds of fuses are used: micro mini type for lower amperage rating, cartridge type, and multi fuse for higher amperage ratings. Replace the fuse with the ignition “OFF”, switch off of all electrical devices and then separation (-) terminal from the battery in a safe place. When replacing a blown fuse or relay with a new one, make sure the new fuse or relay fits tightly into the clips The incomplete fastening fuse or relay may cause the vehicle wiring and electric systems damage and a possible fire. Do not remove fuses, relays and terminals fastened with bolts or nuts.The fuses, relays and terminals may be fastened incompletely, and it may cause a possible fire. If fuses, relays and terminals fastened with bolts or nuts are blown, we recommend that you consult with an authorized Kia dealer.